It's a new year and whilst I'm not a big fan of New Year's resolutions I do try and use this time of year to have a bit of a tidy-up of my working environments and adopt some better ways of working. Despite being a developer who's used version control for years to manage application source code one thing I've been guilty of for some time now is not version controlling my PowerShell code scripts. Shock, horror I know -- but I'm pretty sure I'm not alone. In this post I'll be sharing how I solved this, but first let's take a quick look at the problem. If you are a Visual Studio developer then tools you are already likely using offer one solution to this problem. And if you aren't a Visual Studio developer then the same tools can still be used -- very possibly for free. 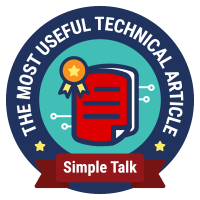 As you've probably already guessed from the blog title, the tools I'm suggesting are Visual Studio (2015, for the script editing experience) and Visual Studio Team Services (VSTS, for version control). Whoa -- Visual Studio supports PowerShell as a language? Since when did that happen? 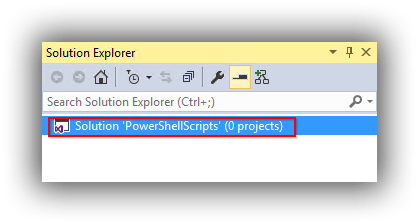 Since Adam Driscoll created the PowerShell Tools for Visual Studio extension is since when. 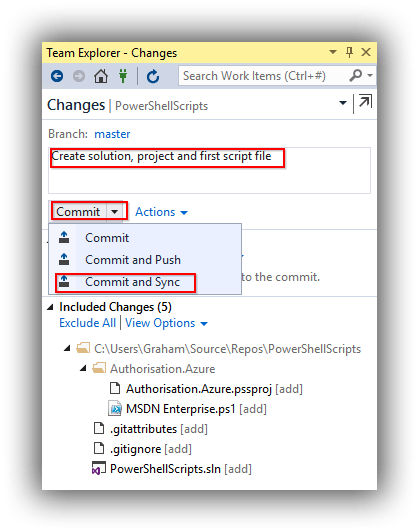 The aim of this post is to explain how to use Visual Studio and VSTS to version control PowerShell scripts rather than understand how to start using those tools, so if you need a primer then good starting points are here for Visual Studio and here for VSTS. The great thing is that both these tools are free for small teams. If you want to learn about PowerShell Tools for Visual Studio I have a Getting Started blog post with a collection of useful links here. In my implementation below I'm using Git as the version control technology, so please amend accordingly if you are using TFVC. Now we know that our PowerShell scripts are going to be version controlled by VSTS the next thing to decide is where in VSTS you want them to reside. 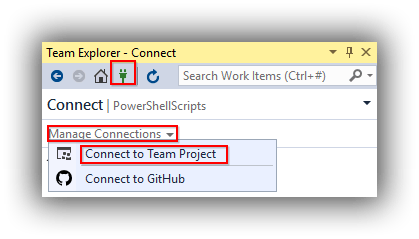 VSTS is based around team projects, and the key decision is whether you want your scripts located together in one team project or whether you want scripts to live in different team projects -- perhaps because they naturally belong there. It's horses for courses so I'll show both ways. 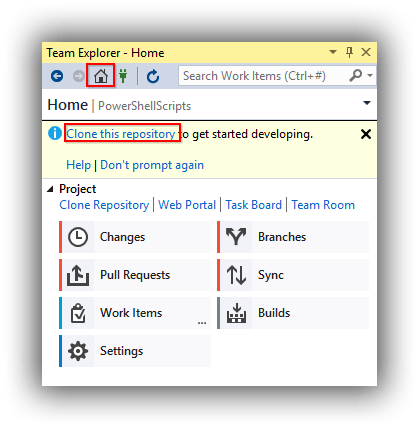 A Create a new repository dialogue will appear -- I created a new Git repository called PowerShellScripts. You can ignore the Add some code! call to action as we'll address this from Visual Studio. 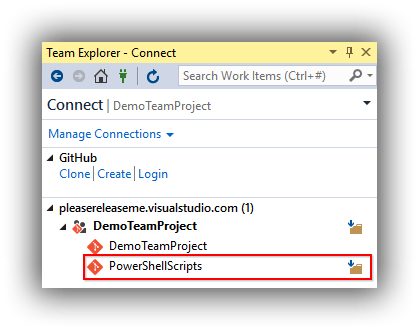 Alternatively, if you want to go down the route of having all your scripts in one team project then you can simply create a new team project based on Git -- called PowerShellScripts for example. The newly created project will contain a repository of the same name putting you in the same position as above. 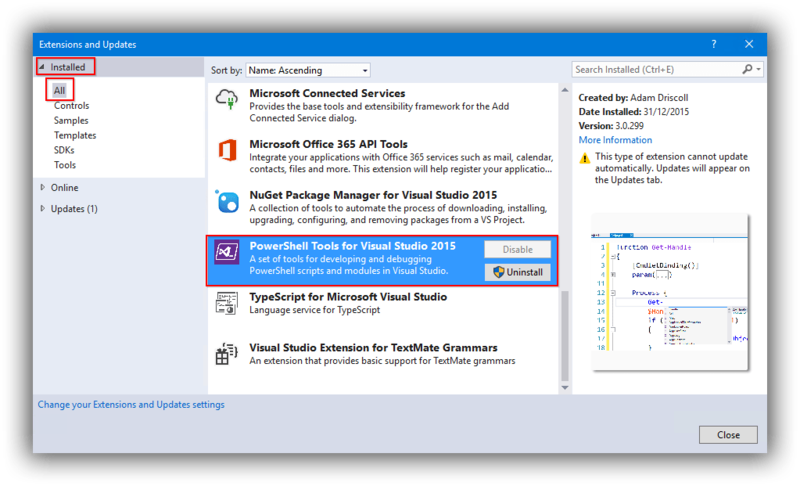 If you don't see the extension you can install it from Online > Visual Studio Gallery. This brings up the Connect to Team Foundation Server dialog which (via the Servers button) allows you to register your VSTS subscription as a ‘server' (the format is https://yoursubscriptionname.visualstudio.com). Once connected you will be able to select your Team Project. This will take you directly to the cloning link on the Home panel -- no need to click the Home icon. Whichever way you get there, clicking the link opens up the settings to clone the repository to your local machine. If you are happy with the settings click Clone and you're done. At the moment we are connected to a blank local repository, and the almost final push is to get our PowerShell scripts added. These will be contained in Visual Studio Projects that in turn are contained in a Visual Studio Solution. I'm a bit fussy about how I organise my projects and solutions -- I'll show you my way but feel free to do whatever makes you happy. The solution has no projects so right-click it and choose Add > New Project from the popup menu. This is the same dialog as above and you need to navigate to Installed > Templates > Other Languages > PowerShell and select PowerShell Script Project. At this point it's worth having a think about how you want to organise things. You could have all your scripts in one project, but since a solution can contain many projects you'll probably want to group related scripts in to their own project. I have a few scripts that deal with authorisation to Azure so I gave my first project the name Authorisation.Azure. Additional projects I might need are things like DSC.Azure and ARM.Azure. It's up to you and it can all be changed later of course. The new project is created with a blank Script.ps1 file -- I usually delete this. There are several ways to get your scripts in -- probably the easiest is to move your existing ps1 scripts in to the project's folder in Windows Explorer, make sure they have the file names you want and then back in Visual Studio right-click the project and choose Add > Existing Item. You should see your script files and be able to select them all for inclusion in the project. Don't Forget about Version Control! In Team Explorer click on the home button then click Changes. Everything we added should be listed under Included Changes, plus a couple of Git helper files. This has the effect of committing your changes to the local repository and then syncing them with VSTS. 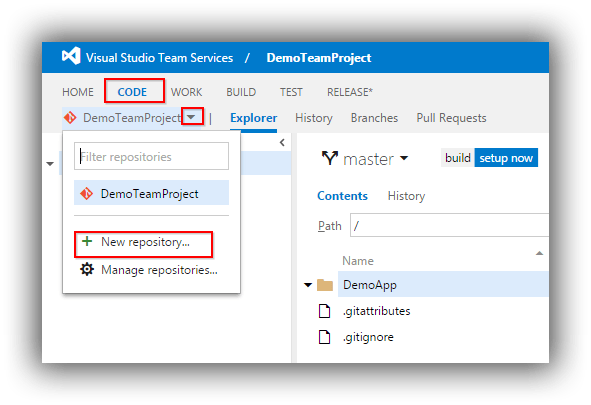 You can confirm that from VSTS by navigating to the Code tab and selecting the repository. You should see the newly added files! Broadly speaking the previous steps are the ones you'll use to check in any new changes that you make, either newly added files or amendments to scripts. Of course the beauty of Git is that if for whatever reason you don't have access to VSTS you can continue to work locally, committing your changes just to the local repository as frequently as makes sense. When you next have access to VSTS you can sync all the changes as a batch. 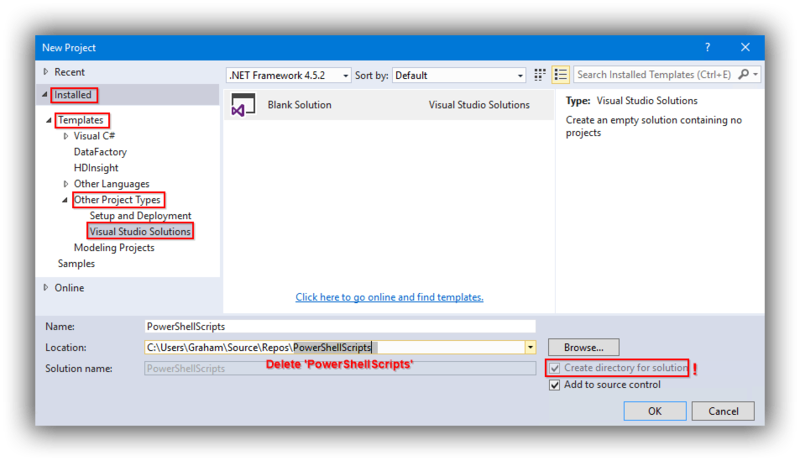 Finally, don't loose sight of the fact that as well as well as providing version control capabilities Visual Studio allows you to run and debug your scripts courtesy of the PowerShell Tolls for Visual Studio 2015 extension. Do be sure to check out my blog post that contains links to help you get working with this great tool.